redbet is licensed by the UK Gambling Commission and the Malta Gaming Authority and offers 24/7 customer support via telephone, live chat and e-mail. Yes yes yes! What a lovely website redbet offer! To be honest, I always decide on whether I like a casino’s site within the first 10 seconds of landing on the page. It’s like people always say, “first impressions count for a lot”, and they really bloody do. And the first impression I get from redbet is a very good one indeed, it just looks so beautiful and sleek. Then once you start to dig around a bit you realise that redbet have more to themselves than a decent first impression and lovely aesthetics. The navigational journey is super impressive, and it’s so easy to fly around the place. And if you do struggle with anything, there’s always 24/7 customer support on hand to help you out too! Ex-cell-ent-é! redbet has most of the popular payment methods out there including Visa, Mastercard, bank transfer, Skrill, Neteller, WebMoney and zimpler. The minimum withdrawal and deposit amount is £10. The maximum deposit limit is £2,000 per transaction and the withdrawal limit is £1,000,000 via bank transfer, £3,000 via credit and debit cards, and £10,000 via e-wallet. 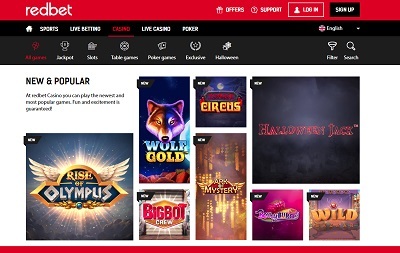 redbet don’t offer the widest array of games I’ve ever seen, but they do offer a lot of quality which includes games made by NetEnt, Play’n Go, Microgaming and Quickspin. In terms of what’s on offer, we’ve got progressive slots (including Mega Moolah and Mega fortune), we’ve got classic slots (including Starburst and Gonzo’s Quest), we’ve got table games, we’ve got poker, we’ve got live casino, and we’ve even got a lovely little sportsbook too! Fine work. What a great casino this is! 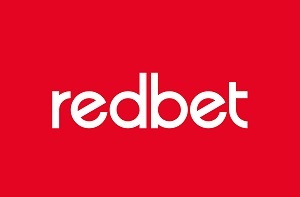 Not only does redbet offer a quite beautiful website, which is hard to create in itself, but it backs that beauty up with plenty of brawn and personality. We’ve got great payment methods, we’ve got all the best games, we’ve got 24/7 customer support, we’ve got a pretty decent welcome bonus, and we’ve got an easy negotiate navigational journey. It may have taken redbet 13 years to create an online casino to accompany their sportsbook, but my gosh was it worth the wait!